Then-FBI Director Robert Mueller on Capitol Hill in 2013. Are Americans growing tired of the Russia investigation? On Wednesday, a new Politico/Morning Consult poll found that 36 percent of registered voters have a negative view of special counsel Robert Mueller, who was appointed last year to probe whether members of President Trump’s 2016 campaign worked with the Russian government in an effort to influence the election. It’s a significant increase from last summer, when only 23 percent of voters had a negative view of Mueller. The poll got a lot of attention. At first blush, Morning Consult’s survey appears to show that President Trump’s narrative about the Russia investigation — that it is a “witch hunt” run by politically motivated law-enforcement agents bent on undermining Trump’s victory — is taking hold, giving the president and his allies more ammunition to argue that Mueller should wrap it up. But shifting public opinion about Mueller doesn’t necessarily indicate that people’s minds are changing about the investigation. A look at Mueller’s favorability ratings over the past year shows that more and more people have an opinion about the special counsel. 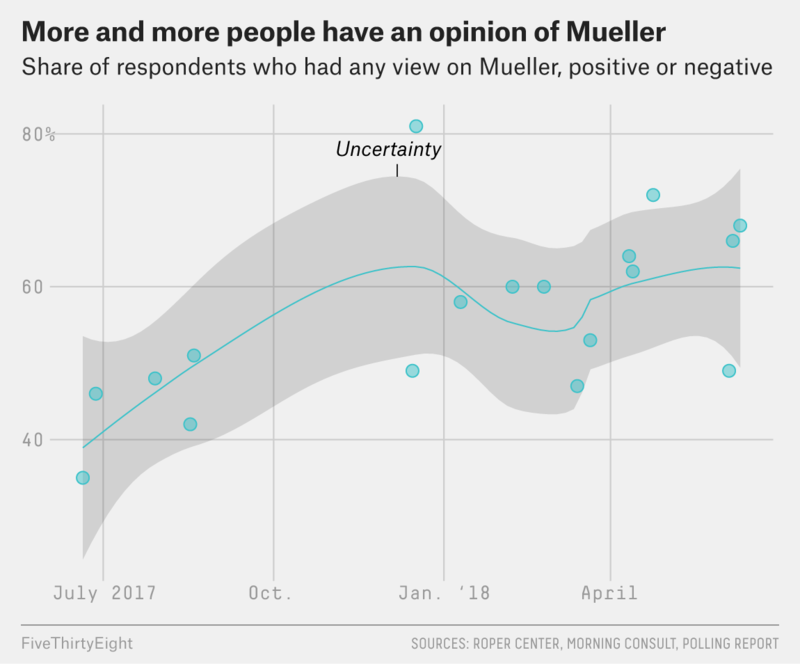 And as he’s transitioned from being a relatively obscure bureaucrat to a fixture in the news, the number of people who dislike Mueller has certainly grown (particularly among Republicans), but most polls show that his support is expanding as well. This suggests that the Russia investigation isn’t losing traction among Americans overall — it’s just becoming more polarizing. And that was likely inevitable. For both approval and disapproval rates, answers that included an adjective like “somewhat” or “very” were counted in their larger category. Polls word questions differently, including asking whether respondents approve or disapprove of Mueller, approve or disapprove of the way he’s handled the investigation, or have favorable or unfavorable views of Mueller. There just isn’t much of a pattern in the data to back up the idea that Mueller’s support is declining across the board. Morning Consult found a 7-point increase in Mueller’s favorability rating and a 13-point increase in his unfavorability rating since last July, which puts his net approval rating (his approval rating minus his disapproval rating) at -4 now. But other pollsters who have tracked Mueller’s favorability over time1 don’t show consistent shifts. Fox News found Mueller with a +6 point positive rating this month — the same as they found in April. NBC News/Wall Street Journal found Mueller at +11 this month, +9 in March, +7 in December 2017 and +13 last summer. There’s no sign of a consistent trend between pollsters. Here’s the cumulative share of people who have had an opinion of Mueller — whether they approve or disapprove — over time. It shows his name recognition, and people’s willingness to express their thoughts on him, rising overall. We can see a similar pattern in Americans’ views of the FBI and its former director, James Comey, who took a beating in Thursday’s report from the Department of Justice’s Office of the Inspector General about the probe into Hillary Clinton’s use of a private email server. Comey has never been especially popular, but the balance of public opinion didn’t shift decisively for or against him as he became a household name. There’s just not a clear trend either way in the size of the gap between those who have a favorable view of Comey and those who don’t. And even when public approval does fluctuate, it doesn’t always mean that everyone’s mind is changing in the same way. 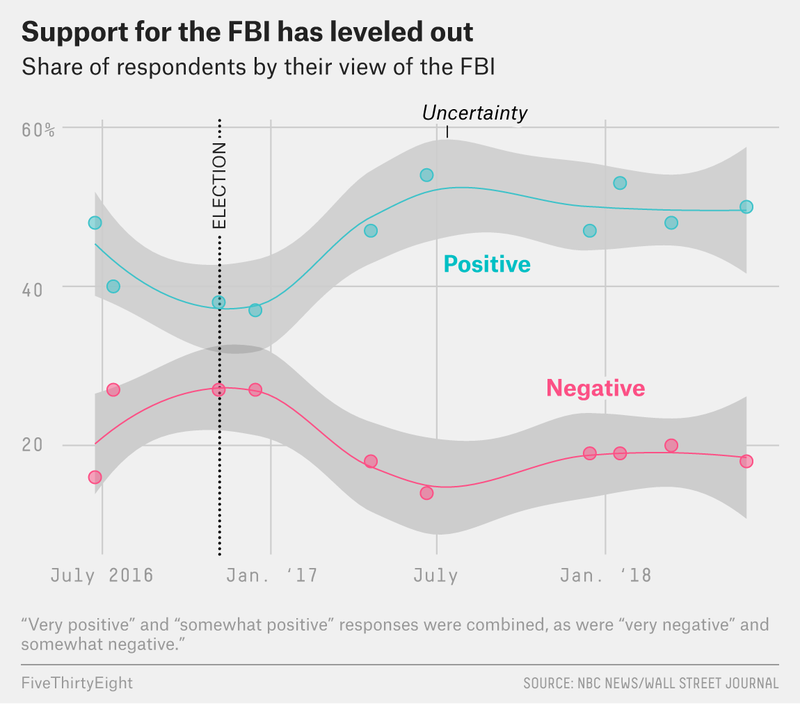 Take perspectives on the FBI, which has become one of Trump’s favorite punching bags — for example, he recently attacked the agency with unsubstantiated claims that it had planted a spy in his presidential campaign for political purposes, and he contested the inspector general’s conclusion that there was no bias in the Clinton email investigation, saying there was “total bias.” Public opinion on the FBI has shifted somewhat over the past two years, with a notable dip in favorability right before the 2016 election, but the changes haven’t been dramatic and they don’t show a consistent downward trend. It’s likely that these variations are due to the changing partisan views we identified earlier this year — with Democrats warming to the FBI while Republicans sour on it — and that these shifts are essentially canceling each other out. Taking a birds-eye view of these trends highlights the divisiveness of the Russia investigation and the law-enforcement officials and agencies caught in its orbit. Last week’s Morning Consult poll found that Republicans have increasingly negative views of Mueller, but the data from other polls doesn’t show a substantial shift in public opinion more generally. In such a rancorous political climate, Mueller in particular was bound to gain more detractors. But that doesn’t mean Trump’s campaign to discredit the Russia investigation is working. We rely on pollsters who’ve asked the same question over multiple polls because comparing results over time from the same pollster ensures we’re doing an apples-to-apples analysis; differences in the way pollsters conduct polls and ask questions tend to lead to lots of variation in the results they get.